This was perhaps the most awaited restaurant in Singapore, and the first few months after its opening have been so booked up that it was hard to get a table if not very long in advance. It has now been sufficient time to make a booking without too much hassle, and I finally got to try the food, although just for lunch. The 5 course lunch menu is priced $128++ per person, which makes it more accessible than the dinner offering if you just want to have a taste of the food. 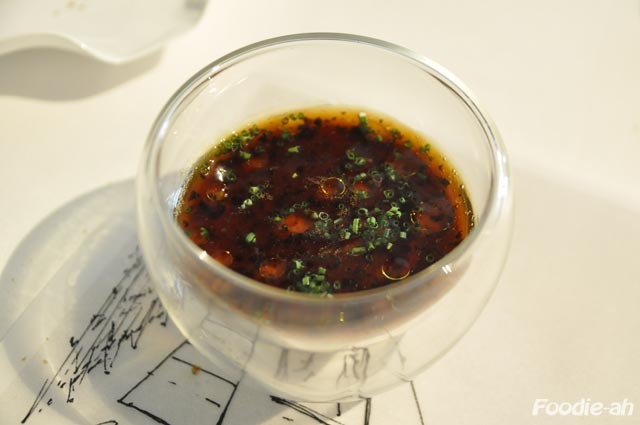 The setting is minimalistic and sober, just like the presentation of André's dishes. We were accompanied to our table, located on the upper floor. The lower floor seemed to be closed for lunchtime. The dining room is spacious, divided into two areas, one of which overlooks the courtyard and the olive tree that stands out in the middle of it. The menu was printed onto semi-opaque sheets, which were placed on the table like mini table cloths. We were served an amouse bouche of crispies flavoured with onion and porcini mushrooms. 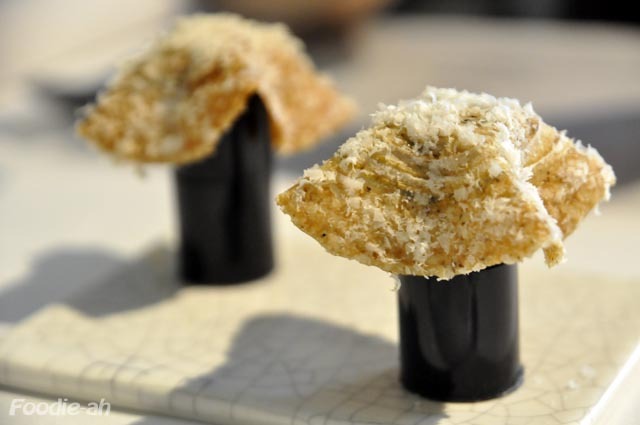 It felt like having a "French onion soup" crystallized onto these crispy textures. An interesting start. 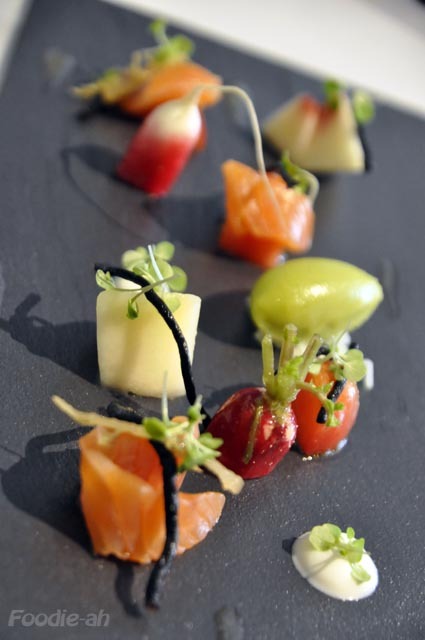 The starter was a "decomposed salad" of tomatoes and smoked salmon. Everything on the plate was of good quality, although this dish failed to impress me. It was a refreshing starter, but it lacked of that extra something to make sense of it all. Perhaps that something was meant to be the basil flower sorbet, but I didn't quite get it. 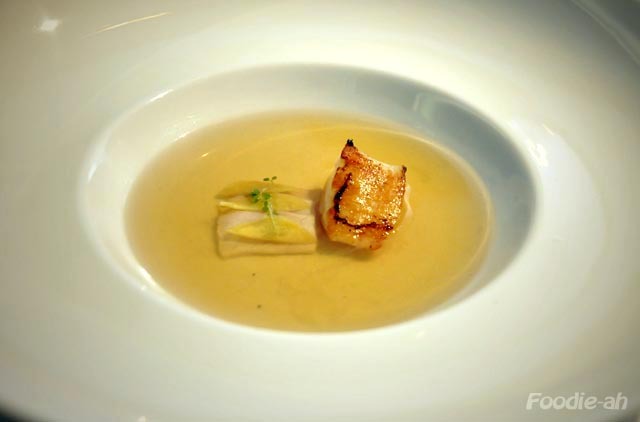 Next was a sharp and clean kaffir lime consommé with a pan seared scallop, cured fish and mini baby leek ravioli. Everything was really mignon in this dish, visually exciting, but despite the homeopathic portions you could clearly taste all the different components and they all worked really well in combination. Next, the foie gras mousse with black truffle. It seemed like every dish that we were served was more exciting, in a crescendo of flavour. I am not a huge foie gras fan, not that I don't like it, but because it tends to become a bit monotonous. Whenever a menu wants to look expensive, it seems that it must include pan fried foie gras paired with some fruit or jam. But this dish was really something different. The pairing of two delicacies such as foie gras and truffle, striking the right balance between the two aromas, lightening up the richness of the foie gras in a custard-like texture. This little bowl was packed with seductive flavour. I was at that point eager to get onto the main course, as the meal kept getting more interesting at every subsequent dish. And I must say that the short ribs didn't fail to exceed my expectations. The sous-vide short rib was incredibly tender, juicy, rich of thin layers of fat, and incredibly flavoursome. Eating that just makes me wonder "why doesn't mine taste like this?". But the polenta bianca with wild mushrooms was not any less impressive. It was rich and packed with mushroom aromas, a bit runny, unlike classic polenta. I found this really inspiring, and I think I will soon open a pack of polenta bianca which I have been keeping in storage for the last 3 months or so. This is a dish I would come back for, and I would be happy to have it exactly the same. 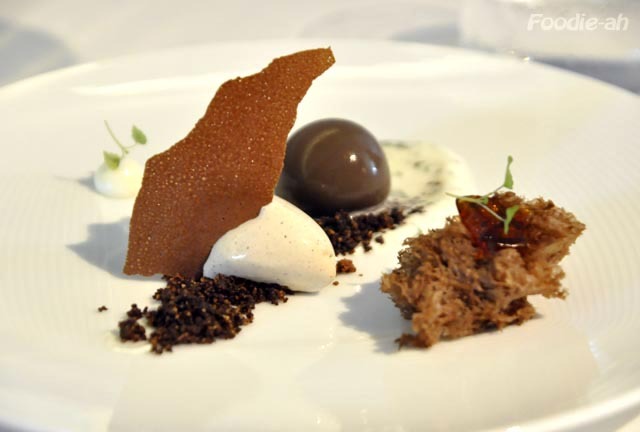 I was always impressed by André's desserts when he used to work at Jaan. Thje indication on the menu that we would end up with a concert of chocolate got me excited. I couldn't reconcile what was on the plate with the description on the menu: "Tarte au chocolat" with milk pudding and ice cream "Milk marmalade". However, this was exactly the kind of dessert I was hoping for! The chocolate ball was only tepid outside, but once squashed, it oozed out a beautifully warm chocolate ganache. I enjoyed biting into that squishy textured shell while warm, rich chocolate kept oozing out! I loved the pairing of ice cream with crunchy cocoa nibble-like sand. I am never impressed by light sponges, which are so popular in modern desserts, but I did like the caramel jelly that came on top of it. 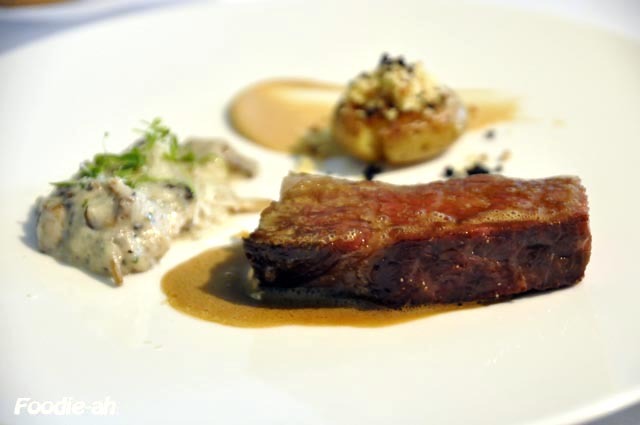 André didn't fail to meet expectations, and although meals at his restaurant don't come cheap, you are guaranteed one of the best dining experiences you can possibly have in Singapore. Every detail is taken care of with real passion, from the very moment you approach the restaurant: visual, comfort, service, and of course, food. Just try and give them a call, I think that's just a rumour. When I went, I got it straight away and it wasn't even busy.